Surbana Jurong (SJ), one of the largest Asia-based urban and infrastructure consulting firms, last Friday (18 January) unveiled its new campus and global headquarters in Singapore. 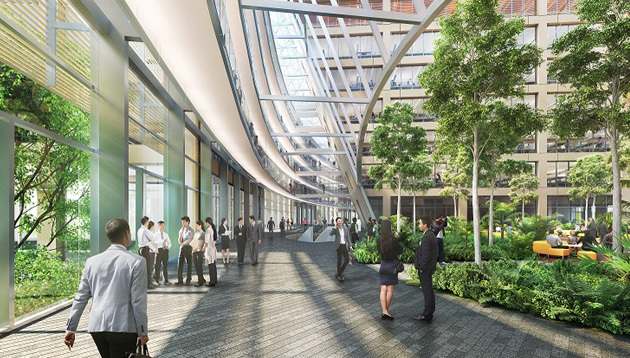 Named ‘Surbana Jurong Campus’, the 68,915 square meter development will be built in Jurong Innovation District (JID) and can accommodate up to 4,000 employees. Designed by Safdie Surbana Jurong, a collaboration between Safdie Architects and Surbana Jurong established in 2017, it demonstrates what a sustainable, people-centric and future-ready workplace would look like. SJ’s multi-disciplinary team of experts will undertake the entire development from start to end. Left to right: Wong Fong Fui, Chairman of Boustead; Ng Chiang Ling, CEO of M&G Real Estate Asia; Wong Heang Fine, Group CEO of Surbana Jurong; Liew Mun Leong, Chairman of Surbana Jurong; Dr Loo Choon Yong, Chairman of JTC and; Moshe Safdie, Principal of Safdie Architects at Surbana Jurong Campus’s groundbreaking event. Once completed in 2021, the Campus will support SJ’s rapid growth by facilitating stronger teamwork and knowledge sharing among its talent. It will also serve as the nerve centre for research and development of innovation for the built environment as SJ transitions to applied research to create and bring practical and viable solutions to the industry and community. The Campus’ location in JID provides the Company access to a vibrant and collaborative ecosystem of R&D and capability developers, startups, and technology enablers for potential collaborations to accelerate the adoption of smart technologies and solutions. Artist impression of Surbana Jurong Campus. The building of Surbana Jurong Campus will also embrace the use of digital technologies to scale up productivity and efficiency. The development will leverage Building Information Modelling (BIM) and extend it to a comprehensive Integrated Digital Delivery (IDD). The latter fully integrates processes and stakeholders along the development value chain through advanced info-communications technology and smart technologies. In line with SJ’s commitment towards delivering sustainable urban solutions, the Campus is designed to meet Singapore’s Building and Construction Authority’s (BCA) Green Mark Platinum Certification for Super Low Energy Building. Solar photovoltaic technology which will yield around 340MWH of renewable energy annually. Rain gardens and bio-swale to enhance water sustenance. Predictive smart building control systems such as live energy and water management dashboards. To fund the development of the Campus, SJ adopted a ‘develop and lease’ model. 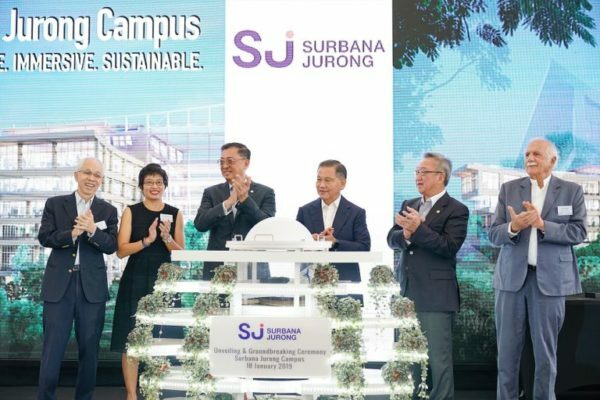 The Campus is being developed by Surbana Jurong Capital, the investment arm of SJ, which secured 100% funding for the development of the property and subsequent lease agreement for the entire land lease tenure from M&G Real Estate. This arrangement provided SJ with a compelling, long-term and cost-effective solution in developing the property for its use. The Campus is a result of strong collaboration and on-going support from the Singapore Economic Development Board (EDB).